Woodrow Wilson was admired as a writer, a scholar, and an educator more than two decades before he became president. He spent twenty-four years working in the academic world as a professor, then as a college president, before he was elected governor of New Jersey. Two years later he was elected president of the United States, led the country through World War I (1914–18) and was the primary architect of the League of Nations. Stephen Woodrow Wilson was born in Staunton, Virginia, on December 28, 1856, the son of Joseph and Jeanie Wilson. His father was a Presbyterian minister. Wilson briefly attended Davison University in North Carolina, but transferred to Princeton University and graduated there in 1879. He received his doctorate in 1886 from Johns Hopkins University. In his doctoral thesis Wilson analyzed the American political system, and criticized what he believed was a breakdown of power in Congress, which was caused by the committee system. He believed that the president ought to solely lead the nation, a view that did not change once he was in the White House. From 1886 to 1910 Wilson was in academic life—as a professor of political science at Bryn Mawr College, Wesleyan University, and Princeton. In 1902, he was named president of Princeton. He strongly favored an educational system that promoted a close relationship between teachers and students. By 1910 Wilson had established such a solid reputation as an educator that the Democratic party in New Jersey offered him the nomination for governor. After winning the election, Governor Wilson showed strong leadership, pushing through legislation dealing with such issues as employers' liability and public utilities. His success made him a prominent candidate for the presidency in 1912. He was nominated on the forty-sixth ballot, and went on to soundly defeat former president Theodore Roosevelt (1858–1919) and current president William Howard Taft (1857–1930) in the November election. In the first two years of his presidency Wilson dominated the Democratic-controlled Congress and secured legislation of great historical significance. The tariff (duties or a kind of tax) was revised downward, beginning a policy that was to be of substantial importance later. The Federal Reserve Act created a banking system under governmental control. The Federal Trade Commission Act created a body that has had an important role in preventing monopolies (an overwhelming concentration of power in an industry). Mexico's new military dictator president, Victoriano Huerta, and worked for social reform in that country. In 1914 Wilson ordered the occupation of Veracruz to prevent Huerta from receiving arms from abroad. War was averted when the countries of Argentina, Brazil, and Chile mediated. Huerta was soon overthrown. In August 1914 World War I broke out in Europe. This was a particularly difficult time for Wilson. In addition to the beginning of the war, his wife, Ellen Axson Wilson (1860–1914) died. The grieving president kept himself busy with his work and confided in his three daughters and a few close friends. His grief lightened early the following year, when he met Edith Bolling Galt (1872–1961). The couple married in December 1915. Wilson kept the United States out of the war based on a policy of neutrality (taking no side). But there is little doubt that he sympathized with France and Great Britain and feared the victory of imperial Germany. The warring countries soon began interfering with American trade. The British restricted American commerce, but the Germans proclaimed a new kind of warfare, submarine warfare, with the prospect of American ships being sunk and their passengers and crew being lost. Wilson took German policies more seriously, because they involved the potential destruction of human life, whereas the British interfered only with trade. As early as February 1915, in response to a German declaration instituting the U-boat war, the president declared that Germany would be held to "strict accountability" for the loss of American lives. For a time thereafter Wilson took no action. But on May 7, 1915, the liner Lusitania was sunk, with over a hundred American lives lost. The President addressed a stiff note to Germany. After other painful submarine episodes, Wilson convinced Germany to abandon the U-boat war in 1916. In the meantime the presidential campaign of 1916 was approaching. Wilson was easily renominated and went on to win a close election against the Republican candidate, former Supreme Court justice (and future chief justice) Charles Evans Hughes (1862–1948). Part of Wilson's success came from the Democratic platform that touted the president's ability to keep the United States at peace. "He kept us out of war" was a successful pro-Wilson slogan, though Wilson never promised anything about the country's future involvement in the war. Wilson's efforts to bring the warring countries together were not successful. When the German government sought unlimited warfare on the sea, Wilson severed diplomatic relations with that nation but continued to hope that a direct challenge could be avoided. But on April 2, 1917, Wilson asked Congress for a declaration of war against Germany, and Congress overwhelmingly approved. Wilson believed that the defeat of Germany was necessary, but he held out hope that at the end of the war a League of Nations might be established that would make impossible the recurrence of another bloody struggle. As early as April 1916 the president had begun to formulate his views on this. He was in favor of an association of nations that would act together against any nation that disrupted peace. There was much support for his point of view. Throughout the war Wilson insisted on two things: the defeat of German militarism and the establishment of peace resting on just principles. In January 1918 he proposed the "Fourteen Points" that would need to be met in order to secure an armistice (cease fire) and begin serious peace negotiations. In the negotiations that autumn he made the acceptance of these points the primary condition on the part of his European associates and of the Germans as well. In November 1918 Wilson succeeded; an armistice was signed. Throughout the world Wilson was looked at with great esteem. But difficulties loomed. The 1918 elections returned a Republican majority to Congress. The president himself stimulated partisanship by his appeal to elect a Democratic legislature. Though he selected able men to accompany him to the forthcoming peace conference in Paris, France, he did not think of accommodating the Republican opposition. By insisting on going to Paris in person and remaining there until the treaty was finished, he cut himself off from American opinion. At the peace conference Wilson strove to realize his ideals. He worked on drafting the Covenant of the League of Nations. This would provide for a League Council of the five great world powers and four elective members and for an assembly in which every member state would have a vote. Disputes would either go to arbitration or be decided amongst council members. If they failed to do this, they would be subjected to economic and possibly to military sanctions. They were also to agree to respect and preserve the territorial integrity and political independence of the members of the League. At the talks that eventually led to the Treaty of Versailles, Wilson argued successfully for fairness on many issues, but he had to compromise on two vital points: France and England insisted on huge war reparations (payments for damages) against Germany; and Japan, which had joined the Allies late in the war, was allowed to keep control of a province of China it had invaded. 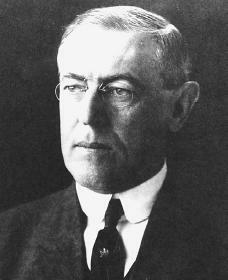 Wilson deeply opposed both resolutions, but he compromised to keep alive his vision for the League of Nations. The Treaty of Versailles was not to stand the test of time. In detaching substantial territories from Germany and in fixing Germany with responsibility for the war, it furnished the basis for that German nationalism which was to strengthen with Adolf Hitler (1889–1945). Wilson returned to the United States with a political battle ahead. Many disliked the Treaty of Versailles and opposed the "world politics" concept of the League of Nations. He erred in demanding ratification of the treaty without any changes. He made his appeal in an exhausting countrywide tour. He was hailed by large, enthusiastic crowds, but his health gave way, forcing him back to the White House. A stroke temporarily incapacitated him. The Senate rejected unconditional ratification but adopted the treaty with reservations that Wilson refused to accept. In January 1920 a compromise was attempted. But Wilson spoiled these efforts by including the issue in the 1920 presidential campaign. In the fall election the Republican candidate, U.S. senator Warren G. Harding (1865–1923) of Ohio, easily defeated a fellow Ohioan, Governor James M. Cox (1870–1957). The new chief executive never sought to bring the Treaty of Versailles to the Senate or to bring the United States into the League, which was by now actually in existence. Wilson's presidency ended in a stunning defeat. Despite this disappointing end to Wilson's eight years in the White House, many historians view him as one of the country's great presidents. Wilson died on February 3, 1924. Clements, Kendrick A. The Presidency of Woodrow Wilson. Lawrence: University Press of Kansas, 1992. Clements, Kendrick A. Woodrow Wilson: World Statesman. Rev. ed. Chicago: I. R. Dee, 1999. Ferrell, Robert H. Woodrow Wilson and World War I: 1917–1921. New York: Harper, 1986. Knock, Thomas J. To End All Wars: Woodrow Wilson and the Quest for a New World Order. New York: Oxford University Press, 1992.